For individuals in the Huntsville area who do not have access to psychological evaluations and treatment through traditional medical referrals, Sam Houston State University’s Psychological Services Center is available to help. The Center will host an open house on Friday (Oct. 26) from 4-6 p.m. at its location on 919 Bearkat Blvd. (16th Street) to familiarize the community with its services. The public is invited to attend. “We offer the latest in empirically-supported psychological treatment and assessment to low-income, underserved populations, and we also offer forensic assessment services to the courts,” said Mary Alice Conroy, director of the center. Among the services the center offers is individual therapy for adults and children with anxiety disorders, depression, behavior problems, grief counseling, adjustment disorders, and anger management. Counseling is also available for families and couples dealing with blended family situations, discipline problems, and communication skills. “We also offer psychological evaluations for treatment recommendations, learning disabilities, attention deficits, developmental disorders and mental retardation,” Conroy said. In addition to individuals, families and groups, the center offers services to local organizations, including the Department of Assistive and Rehabilitative Services, Montgomery County Department of Community Supervision and Corrections, Walker County Juvenile Services, and Walker County Community Supervision and Corrections Department. The PSC also provides services to lawyers and courts. “The center has a dual mission to provide services to the region as well as clinical training for doctoral level students,” Conroy said. Licensed psychologists supervise the students, and services are offered on a sliding fee scale. 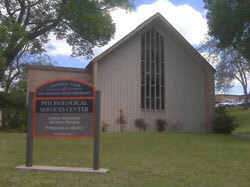 For more information about the SHSU Psychological Services Center and the services the center provides call 936.294.1210 or visit shsu.edu/clinpsy and click on Psychological Services Center.